Two weeks ago, the Trump administration announced that they would be effectively ending the DACA program in six months. The Deferred Action for Childhood Arrivals program provided a means for individuals who were brought here as children to stay in the country as long as they reapplied every six months and did not commit a serious crime. The government indicates that about 800,000 individuals took part in the DACA program, however the decision made by President Trump would halt the reapplication process and therefore these individuals would be eligible for deportation as they could not maintain legal status in the United States. According to some recent polling, providing a pathway to citizenship for Dreamers has broad support with nearly three quarters of Americans in favor. Conservative media sources, such as Breitbart, contend that these polls push respondents to a more liberal answer with ideologically biased wording. But, what’s the religion angle here? The Cooperative Congressional Election Study, a source that we have used extensively at Religion in Public asks, “What do you think the U.S. government should do about immigration?” and individuals were able to check a number of boxes including: “Grant legal status to people who were brought to the US illegally as children, but who have graduated from a U.S. high school?” This question is a very close approximation of what DACA does and I’ll refer to support for this in this post as “support for Dreamers.” It’s important to note that because of the structure of the questionnaire, individuals could check the box if they believed in the statement, but they were not forced to answer the question directly or affirm the negative. In sum, it’s not theoretically sound to say that a box left unchecked is actual opposition to the DACA program. Because of this, the level of overall support is much lower in the CCES (46.9%) than more recent polls, which peg the figure at 75%. This does not mean that it’s inaccurate to compare religious groups inside the CCES because everyone who took the survey was subject to the same survey constraints. The support for Dreamers differs dramatically across the religious landscape. The most supportive groups are the “nones” category, meaning atheists and agnostics. But there is a significant caveat: those who responded that their religion was “nothing in particular” were not nearly as supportive to a DACA program. Those “nothing in particulars” look much more like white evangelicals or mormons than atheists or agnostics. We have discussed previously that there is a great deal of heterogeneity among nones, and this reiterates that point. However, compare the above graph to a visualization of Trump’s support among these same religious groups. The groups that appear at the top of this histogram are often the groups that appear at the bottom of the previous figure. This much is clear: the religious groups that are more conservative politically evidence stronger opposition to the DACA program. This is more directly compared in the graph below. Four major Christian traditions are compared: white Catholics, white evangelicals, white mainliners, and white Mormons. It’s clear here that regardless of religious affiliation those who supported Hillary Clinton support DACA. There is some variation, however. Looking at just those in the analysis who voted for Hillary Clinton, there is somewhat less support for DACA among white evangelicals than white Catholics. Immigration is obviously a multi-faceted issue but it does tap into quite a bit of identity politics. More specifically, a significant amount of Donald Trump’s support emerged from racial resentment among white voters. This has to play a significant role in support for or opposition to any immigration plan. The graph below shows the amount of support for DACA among born again Protestants broken down by self-identified racial identity. White, born again Protestants show dramatically less support for DACA than their African American or Hispanic counterparts. Taken together, the factors that lead to supporting or opposing Dreamers seem to have more to do with political and racial factors than any religious component. This seems to be a case where individuals have a number of “cross pressures” in their lives and religious factors are not stronger than racial or political influences. 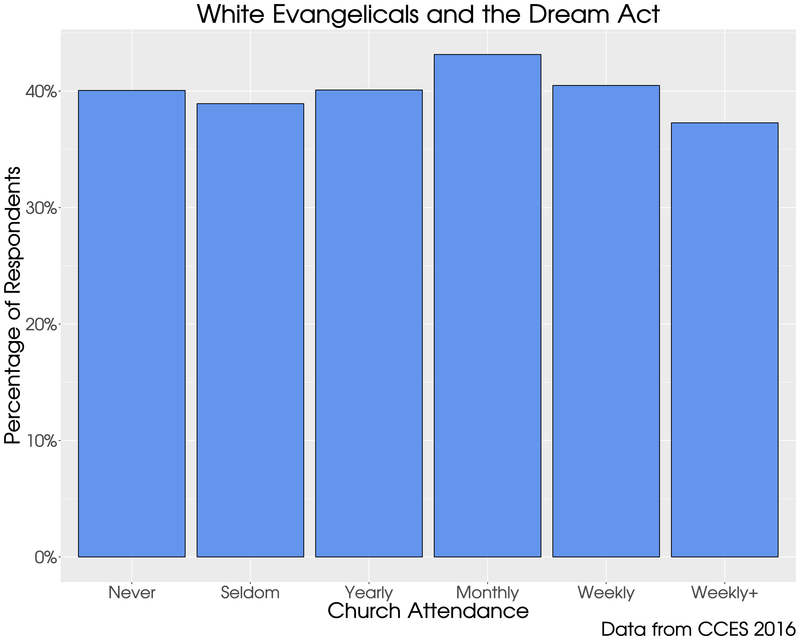 This may be why there is no relationship between how frequently a white evangelical attends church and how strongly they support what the Dream Act does. It seems that guidance from their pastor, to the meager extent that it is available, is being drowned out by the pundits and news media that they are surrounded by on a minute by minute basis.